Join Laurie Schmidlin today as she shares how to create faux gilded leaves – perfect for autumn projects! Create a project utilizing your take on the challenge. Your project must use at least one Papertrey product and include faux gilding like Laurie shared in the video. You will have until 6am ET, Monday, September 24th, to add your link to the list to be eligible to win. One randomly selected winner will be chosen from ALL the entries on Monday, September 24th, after 6am. The winner will be posted here on this blog post, on Twitter and Facebook. The randomly selected winner will get a $25 PTI gift certificate to spend however they like! Wow, those leaves are gorgeous! Can’t wait to give this a try! I used to do leaves like this, but kind of forgot about it. Thanks for the inspiration with your gorgeous card! It’s beautiful Laurie! Those leaves are timeless! Thanks for sharing. 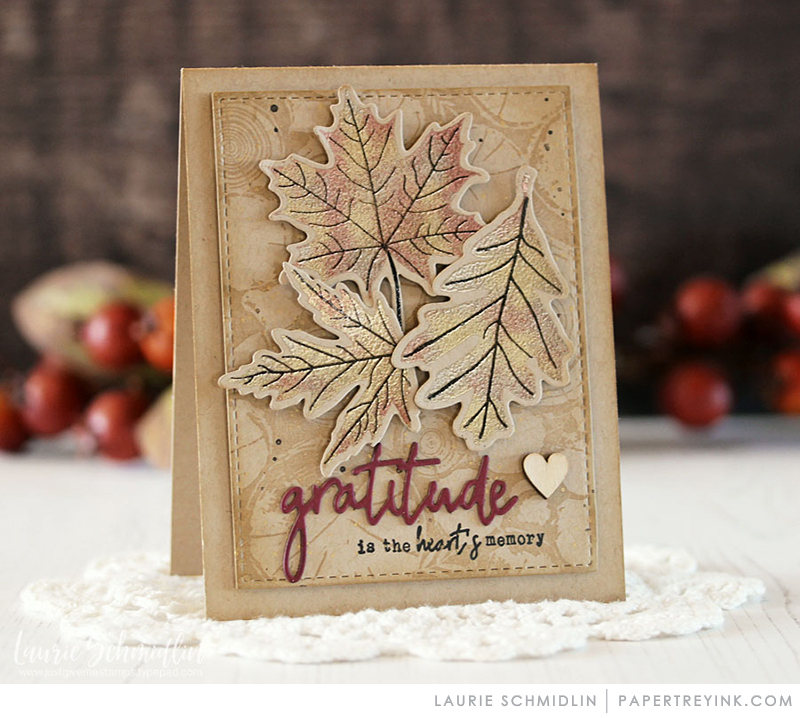 Fabulous challenge and card Laurie! thank you for inspiring me to play along 🙂 !!! Beautiful, I love this way of adding a touch of metallic! This is so pretty! I love the multi colored embossed leaves. The colors are so rich and classy. Just beautiful! Thanks, Laurie, for a very fun project! Loved making those leaves shine! Great card. I really like the shine that is on the leaves.